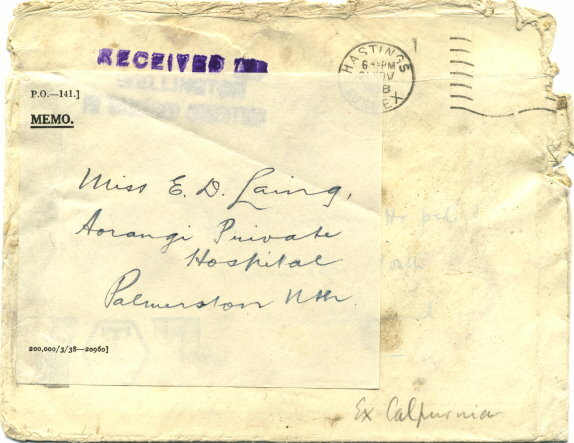 This envelope from Hastings, England was recovered from the Imperial Airways Short S23 C-Class seaplane CALPURNIA G-AETW which landed very heavily on Lake Ramadi on 27th November 1938. This cover received a three line cachet in deep violet reading: “RECEIVED AT / WELLINGTON / IN DAMAGED CONDITION”. The Wellington Post Office then applied an handwritten address label as the original address had become very faint following prolonged water soaking which had also been responsible for the loss of the stamp.